“The natives in the Amazon worshipped it. I’ve watched this movie the night before the Oscar ceremony because I could feel it in my bones this film would possibly win that coveted statuette. Initially, I didn’t want to post my opinion about this winner. But as I had partially written down my opinion, I thought I would smooth off the rough edges and post it anyway. To be honest, I’m not part of the great crowd of admirers of “The shape of water“. Even though I was looking forward to it with great expectations and knew it was a creation made by Guillermo del Toro (I appreciated his previous films) I was only moderately enthusiastic about it. In the end, I stayed behind with a “that’s it ?” feeling. Why the jurors of the academy massively fell in love with this film, still is a mystery to me. I didn’t think it was so earth-shattering, breathtaking or groundbreaking. In retrospect, you could compare this film with “Free Willy“. Only the amphibious creature that needs to be rescued rather looks like the monster of “Creature from the Black Lagoon“. And as in “Free Willy“, where Jesse wanted to free his best friend, it’s Elisa Esposito (Sally Hawkins) who got the job of freeing the imprisoned creature. Only the friendship between Jesse and Willy wasn’t as passionate and they didn’t get caught while doing sensual stuff. Elisa and her scaly friend soon figured out how to get things going. Or rather, Elisa soon knew where her sweet sprat was hiding his stinger. So you can expect some wet scenes. And the facility where the government locked away the feared creature (under military supervision) so they can experiment with it, was probably designed by an interior architect who’s influenced by the interior style that you could admire in the Nautilus. It’s hard to be different. “The shape of water” is of course more than just a rescue mission that has been set up by a cleaning lady without sound. A cleaning lady whose compassion causes her to start smuggling hard boiled eggs inside and draw up a plan (bigger than that in “The Great Escape“) to save the poor merman. 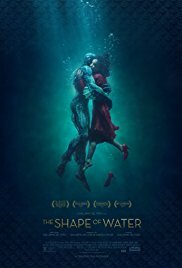 “The shape of water” is also more than just a romantic concoction in which a scrumptious cleaning lady throws herself into the fins of a wondrous creature and loses herself completely after looking deep into those bulging fish eyes. Guillermo Del Torro denounces indifference and prejudice and makes it the central theme. A theme that also applies to our contemporary society. Being different as an individual and the excluding and exploiting by those who see themselves as normal, is symbolized here in many ways. A cleaning lady who is voiceless. And her colleague (Octavia Spencer) who has a different skin color. A somewhat older, homosexual neighbor (Richard Jenkins) whose flirtation was not appreciated by the owner of an ice-cream shop. And last but not least the miraculous seahorse. First a riddle and afterward a threat. Just like in “Crimson Peak“, again Del Torro delivers a visually overwhelming spectacle. The used images are at times magical and atmospheric. Elisa’s residence and the colorful advertising posters made by the neighbor. The cinema complex and the ice cream bar that exhales the atmosphere of the 1960s. The military complex that looks sterile and metallic, full of obscure secrets and where less attractive experiments are carried out. It all looks perfect and breathtaking. And such quality needs, of course, high-quality acting. This sublime acting is taken care of by renowned actors. Sally Hawkins is as enchanting as her salted new friend. And even though there is no sound coming out of her mouth, she knows how to grasp you by using her highly expressive facial expressions. Michael Shannon was also brilliant as the dominant and cruel government agent who (with apparent pleasure) tests his taser on our fishy guy. He’s a pervert whose sexual urges go into overdrive when the partner stays silent during the act. No wonder his hormones go haywire after seeing (and not hearing) Elisa. Finally, kudos to Richard Jenkins and Octavia Spencer. To be awarded or not. That’s the question. Without a doubt, Guillermo del Toro is a master in visualizing and a kind of visionary. He creates a unique atmosphere in his films that you hardly be able to take it all in. I’m never really overwhelmed by the content of his films though. Perhaps the message is sophisticated enough. But every time I have that feeling it’s incomplete somehow. I suppose that the simmering topic in this film is in line with the values that were spread out this year during the awards. The equality of genders. Not tolerating the cross-border behavior. And the fact that the Academy Awards are a more white-tinted business. I guess it’s all about striking the right chords. One aspect of the film that seems to be overlooked, or ignored, is not the attraction the woman has for the fish creature, but the perversity of it. Why is this? We don’t want to muddy the water with discussions of sexual perversity, and fetishes, and therefore detract from the ‘love’ story? Sure it’s fiction, but no woman is going to become sexually aroused, or overly affectionate, towards a fish. It would just make douching that much more of a chore.